Lynn Hanson’s hand is deft, sure, sometimes even catalytic. When she brings that technical confidence to bear on imagery with strong narrative or metaphorical possibility, the results are powerful. 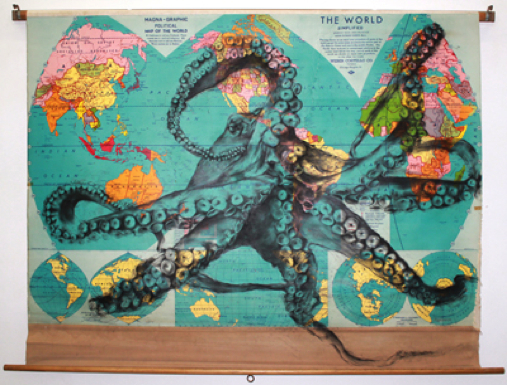 In “Domain,” for instance, one of the highlights of her show at PYO, Hanson draws an octopus atop an old, classroom-style, pull-down map of the world. The creature is an emblem of a kind of imperial reach, a sense of irrefutable control over the broad territory touched by its slithery muscled tentacles. Hanson's rich, vlvety, articulation gives the image a strong, animate presence and contrasts aptly (nature vs. culture with the map's flat colors and neatly delineated countries. PYO Gallery LA, 1100 S. Hope St., Suite 105, (213) 405-1488, through Aug. 14. Closed Sunday and Monday.